We have been offering first class hospitality at affordable prices for the last 28 years. For 2019 we are moving to a facility actually on the course - in fact just 100 yards after the start line. A large impressive site with quality marquee furnishings, a band stand where three different jazz bands will entertain guests throughout the day, complimentary car parking (saving £20 per car) is available right behind the marquees and the usual high standard catering for a 3-course lunch with quality wines and the classic strawberry cream tea will be served. Another benefit is that guests can now have private tables from just 4 upwards. You are just yards from the racing action through the day with a background official commentary keeping you right up to date with the progress of the boats and the results. 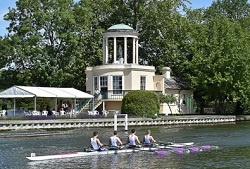 If you wish to leave the car behind, a local boat company, Hobbs of Henley, offer a shuttle service from their boat yard by the bridge at 10am, which after a 45 minute cruise will drop you near our facility opposite Temple Island. Check out their website for details and costs. The iconic Mississippi Paddle Steamer, M.V. Southern Comfort will again be available for a 90 minute cruise during the day to take you up and down the course to soak up the unique atmosphere of the Regatta. Enjoy Pimms & Champagne on board. 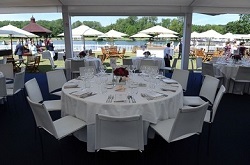 There is a complimentary unlimited drinks service* available from the riverside bars on site. And for clients on the Friday/Saturday complimentary access to Chine White's Night Club adjacent is all part of our unique offer, saving £35 - £50 - the place to be seen!